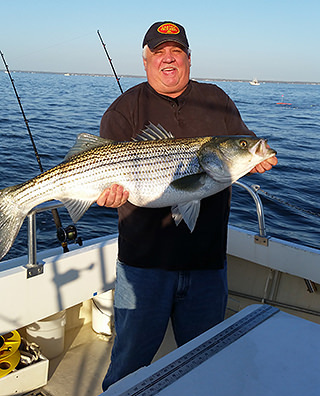 Chesapeake Bay Rockfishing Charters and Crabbing Trips Join Capt. Frank Sr. & Capt. Frank Jr. aboard the Natural LightBook Today! Two men and a young man holding a large Rockfish caught aboard the Natural Light. Capt. Frank, Jr. holding a large Rockfish caught aboard the Natural Light. Group of women holding a basket of crabs aboard the Natural Light. Capt. Frank, Jr. aboard the Natural Light. Man holding a large Rockfish caught aboard the Natural Light. Young lady holding a large Rockfish caught aboard the Natural Light. Kids holding basket of crabs caught aboard the Natural Light. We offer a full range of services including full day and half day charters, crabbing trips, fishing and crabbing combo trips, party and lighthouse cruises and tournament fishing. Book your charter today! Map showing Kentmorr Harbor Marina’s location. Kentmorr Harbor Marina in Stevensville, Maryland.